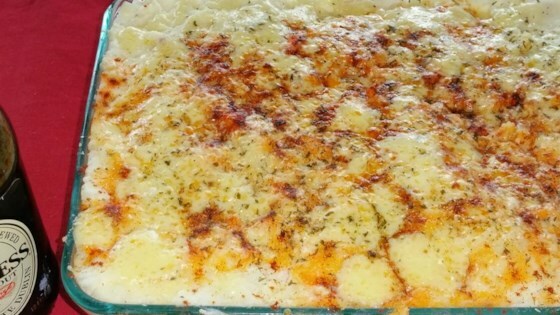 "Yes, shepherd's pie is predominantly thought of as Irish or British. But since I'm Scottish, I thought I'd give it a unique twist to suit my ancestral tastes. The use of lamb, the smoky, heather taste of Guinness® Draught (Irish, I admit), and the topping of sharp Cheddar and smoked paprika give this version its unique, smoky-sweet flavor." Stir potatoes, sour cream, cream cheese, 1 tablespoon butter, egg yolk, 1/2 teaspoon salt, and 1/2 teaspoon black pepper together in a bowl until smooth. Heat olive oil in a cast iron skillet or nonstick pan over medium-high heat. Add ground lamb, reduce heat to medium, and cook, stirring frequently, until browned and crumbly, 4 to 5 minutes. Pour off excess grease and season lamb with salt and black pepper to taste. Stir tomatoes with juice, onion, and carrot into ground lamb; simmer until vegetables are tender, 5 to 10 minutes. Add peas, reduce heat to low, and cook, stirring frequently, until peas are warmed, 2 to 3 minutes. Heat beer in a saucepan over medium heat; add beef bouillon. Cook and stir beer mixture until bouillon is dissolved, about 5 minutes. Heat remaining 1 tablespoon butter in a separate pan over medium-low heat until sizzling. Whisk flour into butter until thick and paste-like, about 1 minute. Stir beer mixture and Worcestershire sauce into flour mixture until gravy is smooth and thickened, 2 to 3 minutes. Stir gravy into lamb mixture and simmer until mixture is thickened, at least 5 minutes. Set oven rack about 6 inches from the heat source and preheat the oven's broiler. Grease a 9x12-inch baking dish. Pour lamb mixture into the prepared baking dish. Carefully spoon mashed potatoes over lamb mixture, covering like a crust. Sprinkle Cheddar cheese, parsley, and paprika over mashed potatoes. Broil in the preheated oven until crust is browned and cheese is melted, 4 to 5 minutes. Cool for about 5 minutes before serving. See a version of shepherd pie with lamb, mashed potatoes, and Cheddar cheese. If using instant potatoes, use a quality brand like Honest Earth® All Natural Creamy Mash. Smoky sharp Cheddar works best. Love this recipe. Something out of the ordinary and easy to make. I also enjoyed the left over beer.